A peacock's magnificent and elaborate beauty has imbued the creature with somewhat of an otherworldly quality which has long made it a symbolic reference in visual histories. 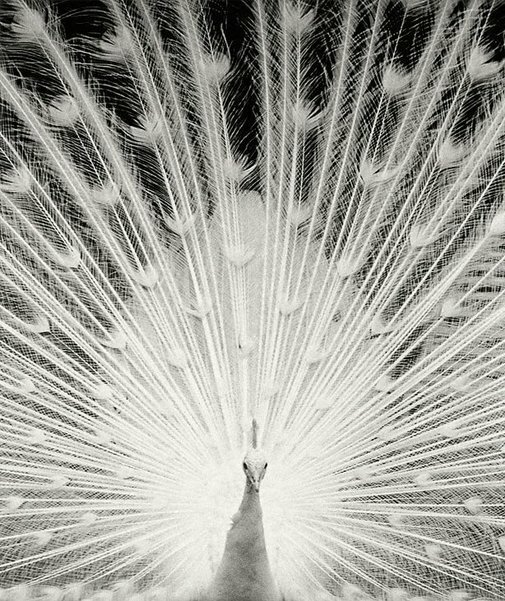 Its ethereal presence appears in Ian Dodd's extraordinary 'White peacock'. Apart from the dazzling beauty of this image, I think that it is Dodd's ability to destabilise what we register as familiar which makes this photograph so alluring - the bird is void of its trademark brilliantly coloured plumage and is instead spectacularly envisioned through a radiating moon-like glow. I am always struck by the peacock's intense luminosity. I liken the effect of this 'shining' bird to that of lightning witnessed against a dense black sky - the peacock has that same silvery 'colour' of a lightening flash and the same sublime presence which is mesmerising as a momentary vision. Dodd transposes the conventional into something phenomenal and the result is breathtaking. By avoiding the 'distraction' of colour, attention is instead drawn to the form of the peacock. The delicate fine lines of its tail feathers emanate from the bird's central features and create exquisite intricate patterns of light that extends throughout and beyond the frame of the picture. The composition itself is quite simple, made up of the flat white shapes of the bird's body and diagonal and cross-hatched lines of the tail feathers, both of which are set against a black backdrop isolating the peacock from any suggestion of its environment. Presented to us with this immediate focus, 'White peacock' not only directs us to contemplate the inspiring forms of nature, but also the hallucinatory qualities the photographic medium is capable of achieving. By 'drawing with light' it can reconstruct realities which the eye alone can not fathom. Dodd's photograph seems to allude to the essence of the subject through a translation of the 'real' and it is the photographic process which facilitates this engagement with an underlying reality. This superb image is undoubtedly one of the highlights of the collection of recent photography at the Art Gallery of New South Wales. It never fails to impress. Each time I see the work I am intrigued by its energy, the force and purity of the light which it exudes. It is an image that draws you in leaving your eye to follow and linger amongst the jewel-like appendages of the peacock's tail feathers. The work is a potent example of Dodd's ability to create a sense of an inherent mystery to that which is around us. Signed and dated c. verso, pencil "...1994/ ...February 2000 .../ .../ Ian Dodd ...". Judy Annear, Photography: Art Gallery of New South Wales Collection , 'Magical realism', pg.226-245, Sydney, 2007, 239 (illus. ).